The Rainbow Machine Air Edition heads up the list of most popular Airspace games! Big news! 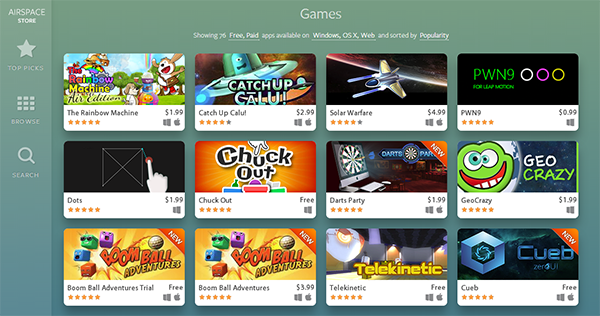 Our latest game, The Rainbow Machine Air Edition, is currently leading the catalogue of most popular games in Airspace, the store for LeapMotion games. Needless to say, we’re very happy to see the outcome of hard work, commitment and perseverance. We love the LeapMotion device and so should you 😉 Regardless of the times of code scavenging and bug hunting, overall development of The Rainbow Machine Air Edition has been a journey full of joy and learning. And coding doesn’t stop. In the upcoming days we’ll have important news about the game we’re currently working on: NagiQ 2. Meanwhile, thanks to everybody for your support! The Rainbow Machine for Leap Motion is now available on Airspace! The Rainbow Machine Air Edition is finally out! The Rainbow Machine Air Edition is now available in Airspace Beta program! Good news! A few months ago we developed The Rainbow Machine Air Edition, a version of our game The Rainbow Machine tailored to harness the incredible capabilities of Leap Motion devices. Our game is now available for free in the Airspace Beta program, so if you’re a Leap Motion user with access to the Beta program, please take a look at our game here. All your comments are welcome! 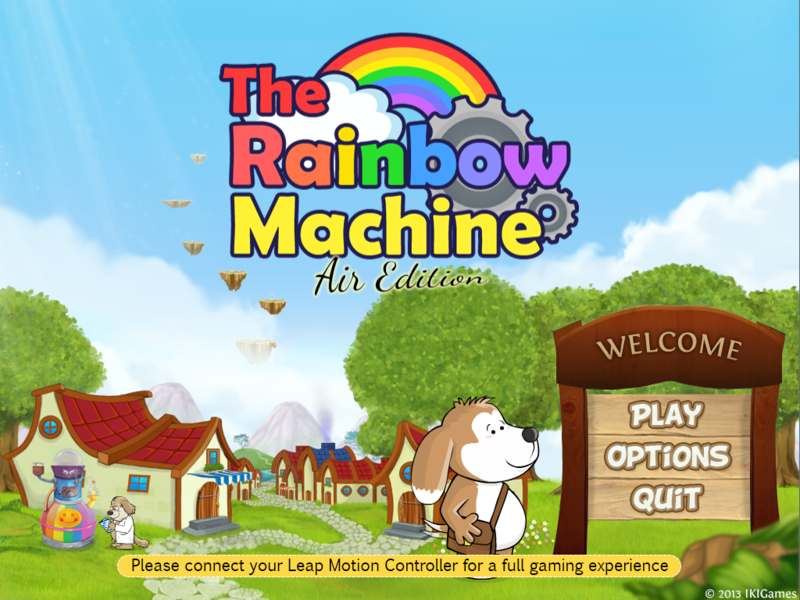 Essentially, The Rainbow Machine Air Edition uses Leap Motion’s gesture detection and motion tracking device and API to offer a novel play experience. As our game is based on LibGDX (using LWJGL as backend for desktop) integrating the Leap Motion API was a pretty straightforward task, which allowed us to release the game for both Windows and Mac OS X. Regarding the gameplay: in The Rainbow Machine Air Edition you use your fingers (or “tools” like some chopsticks or pencils) to control and position a bar. In each of the game’s 140 levels, once the bar is set, a blue ball will automatically fall down and if you have properly placed the bar then the ball will bounce and reach the treasure chest of the level! Do you want to know what’s the most important part about The Rainbow Machine Air Edition?… That we had a lot of fun creating our Leap Motion game! And we hope everyone who plays The Rainbow Machine Air Edition will also experience a fun time. By the way, it’s been a great pleasure to work with the Leap Motion team: support is prompt and complete, they gave useful feedback, conducted an exhaustive testing of the game, and provided a flawless guidance throughout the process. A pleasure to work with them, indeed. March 11, 2013 – IKIGames releases The Rainbow Machine, a physics-based puzzle game available for PC, Mac, Linux, Android tablets and iOS (iPad). 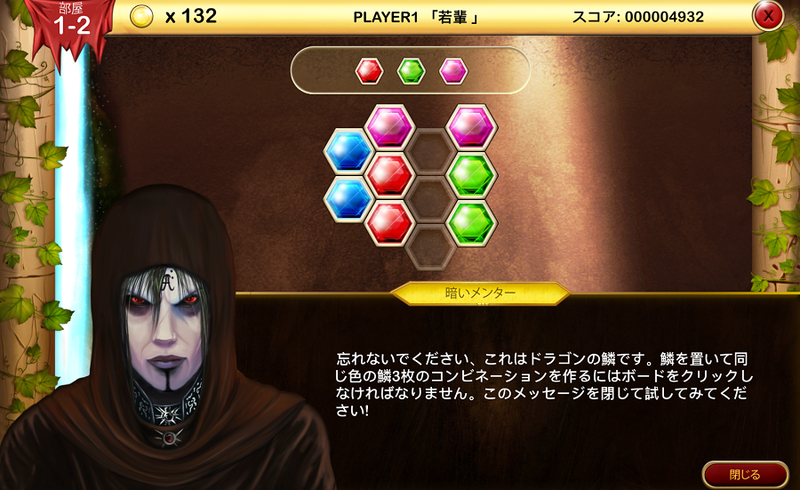 Game play is based on directing a sphere towards treasure chests to retrieve the pieces of the stolen Rainbow Machine. You will have to solve 140 tricky puzzles and also defeat the burglars: a wicked bunch of kleptomaniac rats! 6 islands amounting to 140 playable levels of increasing difficulty. Retrieve 16 pieces and materials of The Rainbow Machine. Collect coins for buying items: Rebounder Improvements, Initial Impulse and Invincibility. Helper items to reach treasure chests. Achievement stars to rate your play. Mischievous bosses are awaiting for you at the end of each island. Unlock new islands by defeating bosses or rising your score. Play a fun Jackpot stage at the end of some levels to win extra coins. And many more game actions. 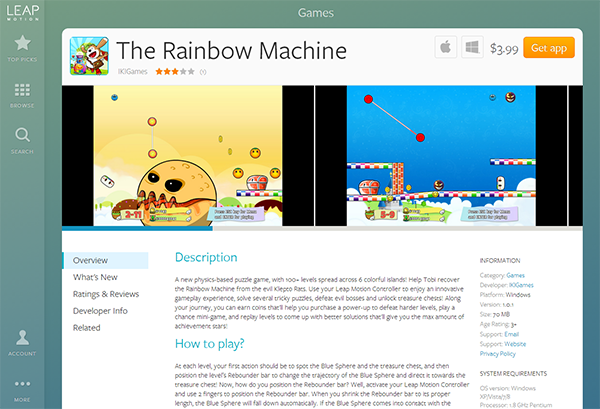 The Rainbow Machine for Windows is available in English, French and Spanish. The other versions are available in the English language. The game is priced at USD 9.99 for PC (on the game’s website), USD 6.99 for Mac (via Mac App Store) and Linux (via Ubuntu Software Center), USD 0.99 for Android (on Amazon) and USD 3.99 for iPad (on the App Store). Free demo versions are available for try out before purchase (Windows, Mac, Linux, Android). Further information and review copies of The Rainbow Machine can be obtained by contacting IKIGames (@superikigames). Available: via IKIGames’s website (PC and Linux), Mac App Store (Mac), Ubuntu Software Center (Linux), App Store (iPad), and Amazon (Android). Demos: Windows, Mac, Linux, Android. Press Kit: The Rainbow Machine’s Press Kit. For a couple days I’ve been busy browsing and modifying source code. The best part of this work is that I’ve learned quite a lot by reading the internals of LWJGL and LibGDX: the authors of such libraries are really clever people. And definitively, the good design in these libraries makes them easier to understand. What I’ve been up to lately is porting The Rainbow Machine to Mac OS X, but using Java 7 (for now, the version currently on sale at FireFlower Games and Mac Game Store is based on Java 6.) The problem: LibGDX is based on LWJGL (for Desktop versions), and LWJGL was not working on Mac OS X with Java 7. However, the LWJGL gurus are already working on an experimental branch which has made great progress. It’s still labeled as experimental, though. I downloaded that version of LWJGL, compiled it, and updated my version of LibGDX. So far, so good. Now, time to change The Rainbow Machine project. I replaced my “official” LibGDX libraries with the ones I had just compiled… and after that the game refused to run. There is a clear workaround: swap audio and video initializations. I did the germane modifications in LibGDX (I changed LwjglApplication.java), et voilà, the game runs nicely. Then I kept playing for a while and did not notice any issues until I decided to close the game by pressing CMD-Q: the game was immediately killed, and that’s not the desired behavior. I want The Rainbow Machine intercepting CMD-Q and behaving as if the red X close button was clicked. In fact, closing the game by means of the menu has a similar effect to CMD-Q. After reviewing LWJGL and the Java source code, I found a simple workaround. I was expecting windowShouldClose in org_lwjgl_opengl_Display.m to be called whenever CMD-Q was pressed. However, windowShouldClose is only called when the window is going to be closed. The window, not the app. If I close the app by clicking on the red X close button, windowShouldClose is indeed invoked. But CMD-Q does not trigger it. This handler simply cancels the game quit, and notifies MacOSXDisplay’s handler about the quit request. And that’s it. The discussion on this widely popular thread revealed that the LWJGL team was thinking of using CMD-Q for effectively killing apps immediately, as an option to kill a crashed LWJGL app (for instance, to avoid mandatory full reboots for crashed fullscreen apps.) However, they’ve noticed that holding CMD-Shift-Option-Esc for 3 seconds kills the app too. Therefore, CMD-Q won’t have to kill the app. In the following days I’ll keep testing The Rainbow Machine. However, of course I’ll be waiting for a non-experimental release of LWJGL on Mac OS X. Specifically, I’d rather not to modify LibGDX: that’s a philosophical issue, suitable to internal workflow here in IKIGames. BTW, if you liked this post you migth want to follow us on twitter. Good news! Now you can purchase the full version of The Rainbow Machine for Android at Amazon.com.